NEW RIDER: This is your first time riding a bike off road ever or at least first time riding in a while. You may not know how to shift, use brake effectively or know anything about good body position. Mountain biking is completely new to you. Trails you may like: You don’t know yet. how to use gears and brakes. You can get over small obstacles in the trail like rocks, logs, low angle switchbacks. You can ride for 1-2 hour comfortably with only a few stops. You are comfortable on green and easy blue trails. are comfortable on fast and flowy trails without stopping. You can get over most bigger obstacles in the trails climbing or descending such as rock gardens, large roots, most switchbacks, etc., and are exploring drops and jumps. You ride about 1-2 times/week and understand the basics of how your bike works. You are comfortable on all blue trails and many black trails. You may have done a race or two. ADVANCED: You ride regularly, 2-3 times per week and are comfortable on 3+ hour long rides. You understand good body position, bike and body separation and can manage most any obstacle without stopping. You are comfortable with air time, wheel lifts, technical terrain up and down. You may be doing big drop, jumps, manuals and riding black and double black trails. You may be racing in the expert or pro category. What can you do for the first 3 weeks after pregnancy? 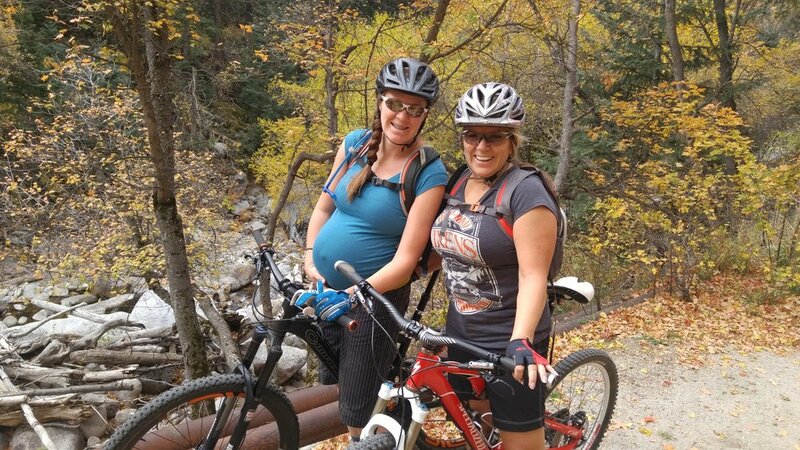 Before I was pregnant I was riding my mountain bike 3-4 times a week. I was in the best shape I have been for years. While I was pregnant I won the 35+ Expert class in an Enduro race and kept riding about 2 times a week. I was hiking and staying active. Then, 9 months later, my body is at zero. It’s amazing how fast fitness and tone go out the window. The day after I had my baby, before the nurse would let me leave the hospital, she gave me the “be kind to your body and let it heal” speech. She told me to keep my physical activity to walking and to rest as much as possible. She also said my body would tell me when I was overdoing it physically and I should listen if I want to avoid any complications. My baby is now 3.5 weeks old. She’s absolutely beautiful by the way, not that I’m biased or anything. And I have done what the nurse ordered, for the most part. I go on walks almost every day while carrying my little one on my chest. I use the greatest carrier called an Ergobaby. It’s basically a backpack worn on your front. I have an infant insert which makes it fit her tiny little body just fine. She wears her pink super suit and stays nice and warm as she snuggles up against my chest. My lime green Ergo is our favorite carrier. This is one stylin' baby. The walks started out being really hard. Imagine, walking maybe a half mile, no hills, at a snail’s pace. I’d get back to the house out of breath and hurting in my hips and back. But after about 2 weeks of this, walks around the neighborhood got pretty easy and pretty boring. So, my husband and I decided to go for a snowshoe in the mountains. After less than an hour, I was pooped. I was bleeding more and my full pelvic area was hurting, not to mention the stiffness I had the next few days. Mentally, this outdoor jaunt was awesome and well worth the pain. Physically, my body was telling me to go back to neighborhood laps. A few days later, I got really sick. I had a fever; chills, sweats, aches and pains. Turns out a clogged duct can put you out like this for days. I am post fever about 4 days and finally feeling good enough to get out and about again. Once week 4 hits, we are heading to the mountains again. I plan to walk daily, snowshoe a few times a week, if I can manage, and start very mellow pelvic strengthening exercises and stretching. The frequency of these “workouts” will depends on how my body handles the first one. I will let you know. Great day for a snowshoe. It is amazing how much time a newborn consumes. Just writing this article, a page of loosely thrown together thoughts, has taken a week to conjure. I feed her, burp her, change her diaper and rock her while she cries or falls asleep. When she sleeps, I can spend a little time with my 3-year-old and finally brush my teeth and shower (so I smell slightly less like rotten milk and BO). I also try to sleep when she sleeps since I get only 5-6 hours of sleep in 2-3 segments each night, if I’m lucky. This leaves no time for cooking nutritious meals or grocery shopping for healthy snacks. I eat what my husband is kind enough to bring home or leftovers from the awesome neighbor who brought a meal. I’m at the mercy of others and am so thankful for the help. I am not drinking caffeine and have stopped chocolate, also cutting way back on sweets. This is mostly to help my baby’s tummy, but also to jumpstart my healthy eating. I am drinking like a fish. To keep up my milk production I must consume copious amounts of water. I’m just grateful my bladder is no longer smashed up against a giant baby toting uterus. If I haven’t said it yet, this baby body to biking body is going to be a very slow process. I am trying to by patient with myself and my body while enjoying this precious time with my newborn. This is the only time she will be tiny and cuddly and I’m trying to soak it up as much as possible. 30 weeks into this adventure. This is my second baby and I'm thrilled to say, she's a girl. Despite my OB's recommendation, I want to ride until my legs no longer fit around my belly. I keep saying it's a month away, but the month comes and I feel great. Some people have given me concerned, what does your doctor think, looks that show their judgement about my "reckless" behavior. The questions are, "but what if you fall? ", "isn't that selfish to put your baby in harms way?" And "wow, you better be careful". I don't want to harm my baby, I don't want to take unnecessary risks. What I do want is to stay healthy, exercise and ride my bike to the best of my current abilities. What people don't realize is that I have been riding my bike for so long that it feels like an extension of my body. Falls still happen when I am pushing myself, but my experience has also taught me where my comfort zone begins and ends. Staying within my comfort zone, while pregnant, has allowed me to keep riding. There are people I run into that cheer me on. They say, "ride the whole time", "you are so amazing for still riding your bike". These are the voices I choose to hear. I choose to listen to the small voice inside my head that helps me continue by telling me to slow down, take a break, don't hit that jump and don't accept that invitation to your favorite ride. I choose to keep riding and try to get exercise where I can. I choose to listen to those voices that cheer me on, not those that might fill my head with doubt. So far, these choices have worked in my favor and the favor of the little life I carry inside. We are both a little healthier and I am much happier because I am still riding my bike. Now if I could just find a chamois and jersey that fit my belly. My mom will actually ride with me when I'm pregnant. 30 weeks along. Temple Quarry Trail, Sandy.